Magically Polished |Nail Art Blog|: Pink Florals for Spring! Hey everyone! Sorry for not posting for awhile, I've been occupied with so many things. So I finally have some blogging time and I am super excited for today's post. Therefore today's post, I am entering it in Julep's Spring Nail Art Competition, I was honored to be asked to participate. Of-course I accepted, so here's my Spring inspired nails. As I was looking through the web for the perfect inspiration, it was quite difficult to choose. So I've decided to be creative and make up one on my own. So this is what I came up with. I think you can say, I was in the mood for something simple and bright! When I think of spring, I think of flowers! Beautiful and lively bright flowers. So as I was planning on the design to create I wanted florals to be the main focus. 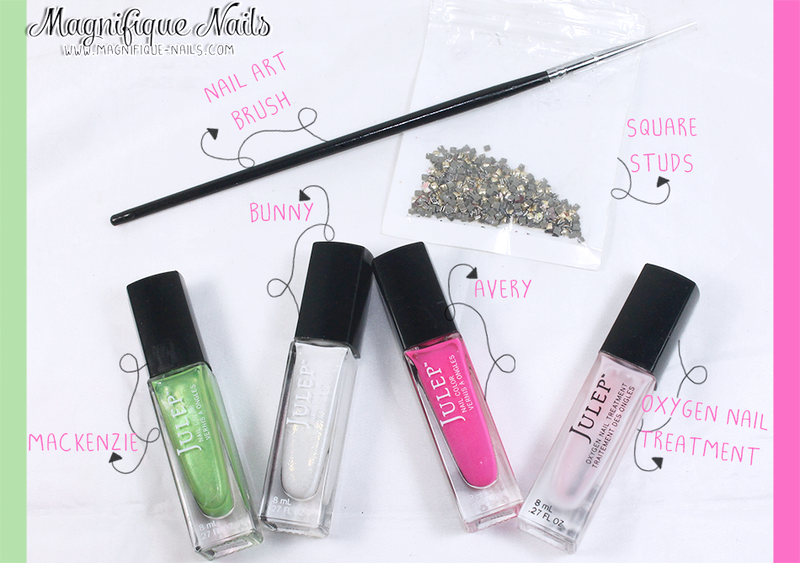 And since this was a nail art contest for Julep, I knew the perfect colors to use. You can also check out the many colors they have here: Nail Polish Color Page. I began by apply the forefinger and pinky, with two coats of Julep Bunny. Which is this lovely white creme, with gold shimmers throughout the polish. It was even perfect on it's own, however, I wanted to accent it with a square stud, on top. For the floral design, I applied two coats of Julep Oxygen Nail Treatment. This gives the nails a nice "allusion" of being clear and helps strengthen nails at the same time. Once the base was completely dry, with a nail art brush, I then freehand the florals on the nails, using Julep Avery. A gorgeous hot pink creme.